Kids and dogs. They go together like chocolate and peanut butter. Believe it or not, a lot of dog trainers don’t see it that way. 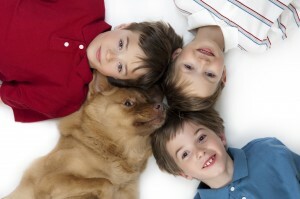 When we started training dogs, few trainers concerned themselves with the needs of typical family pet owners. Instead, they taught everyone training methods developed for police, military, or competition dogs. Classes banned children; lessons required hours of focused practice; and dogs were always “on duty” and strictly supervised. Many still work this way. We decided over 10 years ago to take a more practical family-centered approach. Instead of asking clients to change the way they live to fit our training programs, we redesigned our training programs to fit the way our clients live. You’re not a professional trainer and we don’t expect you to live like one. We involve the whole family in training and welcome children in classes. We’ll teach you fast, fun, effective training techniques that fit into your daily routine to solve real world problems like jumping, play biting, dogs knocking the kids over, counter surfing, leash pulling, chewing, and door dashing. You won’t have to set aside more than 10 minutes at a time to practice in most cases. If you’re looking to train a show champion or a guard dog, we’ll be happy to recommend someone in that business. If you’re looking for someone who understands the challenges of busy families raising kids and dogs together, trust the experts who have dedicated our careers to helping thousands of families and their dogs live in harmony.